For homes in populated cities, gardens and outdoor areas are in short supply and often demand the highest premiums. They are regularly left neglected and can become a wasted space. What if we told you that we could help you transform your balcony, terrace or rooftop and give you an outdoor garden to be proud of? Artificial grass is easy to apply to almost any surface. Whether you have a decked wooden floor, concrete or tiled patio, a few minimal provisions can be put in place before fitting a luscious green lawn. There’s even the added bonus that artificial turf requires low-to-no maintenance and looks impeccable all year round. For homes with pets, artificial grass really is the best solution for small areas in busy town centres. With our synthetic grass products, you won’t have to worry about carrying a lawn mower to the 8th floor or the disposal of grass cuttings. Just give it an occasional brush, and that’s your maintenance done! It’s important to determine how you want to use your outdoor space to ensure you achieve its maximum potential. Here are a few of our ideas for a little inspiration. Outdoor living areas present many opportunities to style it to suit your requirements. Whether you want a tranquil and peaceful area to kick back with a novel and relax in or a more colourful and vibrant dining area for entertaining friends, artificial grass gives you a diverse foundation to build on. For small balconies, use railings or glass partitions as your balcony surround. The more light coming on to your balcony, the bigger it will seem. Just because you’ve opted for fake grass, it doesn’t mean the rest of your garden can’t be alive and living. Use pots and plant boxes to include a dynamic range of shrubs and flowers for added colour and texture. If you have small children, sensory plant boxes offer a great way to get them outdoors and interacting with nature. If you want to add some privacy to your outdoor garden, introduce high vegetation or bamboo grasses. Not only do they add more colour and texture but they are a great natural way to gain privacy when you want to chill outdoors. Whilst you have panoramic views across the glistening city, clever lighting can help create the illusion of a larger space, add a stroke of colour as well as keep your guests safe at night by allowing them to see where they are stepping. Your new artificial grass offers a clean and fresh canvas. There are many effective ways to bring other colours into your high-rise garden. Consider bold coloured furniture or soft furnishings. Different plants that will prosper at different times of the year will bring vibrancy and life throughout the year. 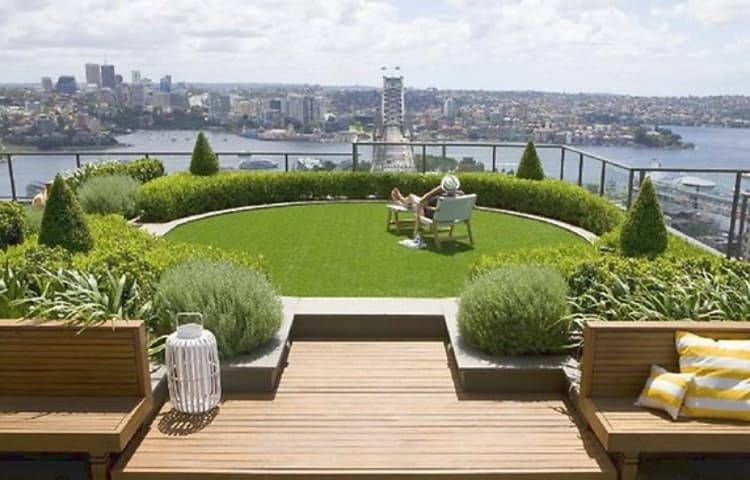 View our artificial grass products, or for more information on how we can help transform your balcony, terrace or roof garden, please get in touch.